Foster Keencut's Heat Knife Carrier accepts HSGM's HSG-0 heat knives and blades (sold separately). 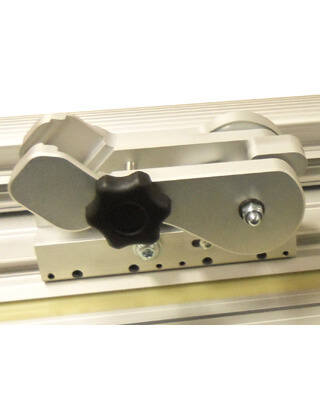 Ideal for accurately cutting and sealing the edges of synthetic fabrics that could flex, unravel or fray, the Heat Knife Carrier attaches to your Keencut Cutter Bar with a single Allen key adjustment (first the Sabre, Sabre 2, Evolution and Evolution-E2 cutter bars). And it doesn't interfere with the cutting head. Save time and money and reduce work-related injuries from cutting by hand or with a standard utility blade. *HSGM Heat Knife & tempered glass sold separately. It is recommended to use 1/4" tempered glass for a long term heat resistant surface. Heat Knives operate most efficiently on tempered glass surfaces, which do not absorb heat (unlike wood and metal surfaces), ensuring maximum blade heat for the most accurate cuts.